The Arbour summerhouse is ideal for a garden retreat and suits a range of garden sizes – as a major feature in small gardens or as a special touch in a larger garden. With models from 6ft x 6ft to 10ft x 10ft, you can find the right size for your garden. It also features an internal bench, a red mineral felt roof and 50mm internal framing. There is a choice of lattice designs and other features to ensure your summerhouse is great for your garden. 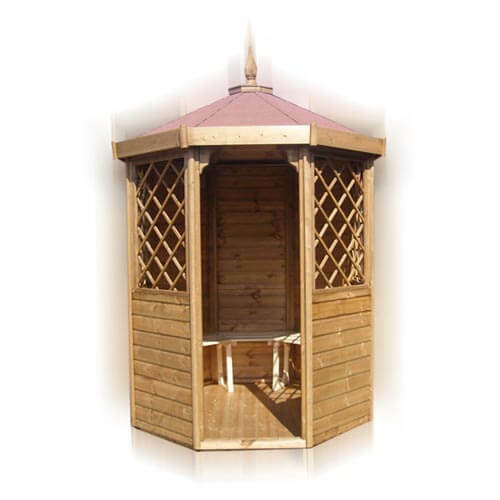 If you want the perfect summerhouse for a range of garden sizes, the Arbour is for you. From lazy summer evenings to crisp winter mornings, its excellent build quality and aesthetics will mean you enjoy your garden all year round.